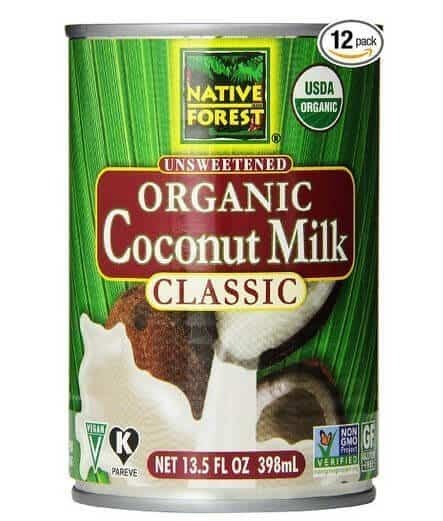 Native Forest Organic Classic Coconut Milk is thick and rich, full-fat coconut milk is a staple of many dishes from Thailand, India and the Caribbean. Native Forest Organic Classic Coconut Milk can be used in these cuisines and much more. Native Forest brand has the additional benefits of being organic, kosher and packaged in a BPA-free can making it a better choice over other brands. The coconuts for this are farmed in Thailand by farmers who practice organic standards. It is made by pressing young coconut meat then taking the oil-rich solution that comes out and mixing it with water and a small amount of organic guar gum. When in the can the fat typically separates from the water and should be shaken before use. Some recipes will actually call for you to leave a can in the fridge overnight then scoop off the fat from the top to use. Make sure you look at the recipe you want to use before shaking the can. A note on guar gum: guar gum comes from the seeds of the guar plant and is considered a natural thickener among other applications. While it is generally considered safe, some users can have stomach trouble from it. Typically, any intestinal discomfort will go away after several days of use as your tolerance increases. Guar gum has many commercial applications and it is likely you are eating it in many other foods so it is unlikely that the amount in this coconut milk (less than 1%) will cause any trouble. Paleo dieters, however, may take issue with the ingredient since it is a legume and the paleo diet avoids these. Some reviewers found that the fat content wasn’t consistent and some cans didn’t even separate, meaning there was likely not enough fat/oil to separate from the water into an actual thick layer like most full-fat coconut will do. Note: While reviewers generally like this product with an overwhelming amount of 4 and 5-star reviews on Amazon, there have been quality issues in the past. A shortage of coconuts did force the company to source some of their product from Sri Lanka instead of Thailand. This was several years ago, but if you are concerned about the country of origin you should always check the can in your hand which will have the most accurate labeling.